It was only a few years ago that the industry was debating the feasibility of using the millimeter wave spectrum for mobile communications and framing the challenges that lay ahead for the radio designer. Much has transpired in a short time and the industry has progressed rapidly from initial prototypes to successful field trials and now we are on the verge of the first commercial 5G millimeter wave deployments. Many of the initial deployments will be for fixed or nomadic wireless applications, but we will also see truly mobile connectivity at millimeter wave frequencies in the not so distant future. The first standards are in place, technology is quickly evolving, and much learning has transpired around the deployment of millimeter wave systems. While we have made much progress, there remain many challenges ahead for the radio designer. Let’s examine some of these challenges for the RF designer in the remainder of this article. Now let’s consider a practical example and derive a simple link budget to illustrate the transmit power requirements for a millimeter wave base station, as compiled in Table 1. The additional path loss compared to that at cellular frequencies is a major hurdle to overcome at millimeter wave frequencies but blockage (buildings, foliage, people, etc.) is another major factor to consider. 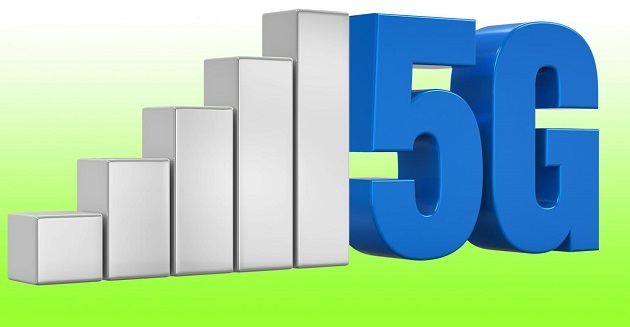 There is a plethora of work reported in recent years on propagation at millimeter wave frequencies, with an excellent overview available in the article “Overview of Millimeter Wave Communications for Fifth-Generation (5G) Wireless Networks-with a Focus on Propagation Models. Several models are discussed and compared, illustrating the dependence of the path loss on the environment, and a comparison of line of sight (LOS) scenarios vs. non-line of sight (NLOS). 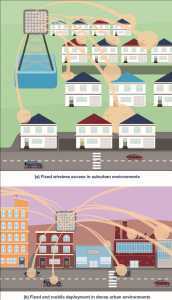 Without going into detail here, we can say that, in general, an NLOS scenario should be considered for fixed wireless deployment given the desired reach and terrain being considered. In our example, we consider a base station with 200 m reach in a suburban deployment. Here we have assumed a path loss of 135 dB based on an NLOS outdoor to outdoor link. If we were trying to penetrate from outdoors to indoors, then the path loss may be as much as 30 dB higher. Conversely, if we assume an LOS model, then path loss may be on the order of 110 dB. We have mapped the progression of possible technologies for the signal chain as we move from digital toward the antenna. 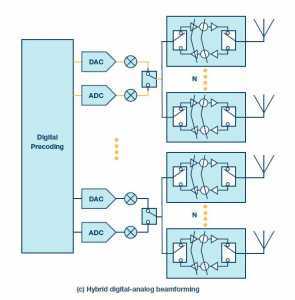 Certainly, the digital and mixed signal are produced in fine line bulk CMOS processes. Depending on the requirements of the base station, the entire signal chain may be developed in CMOS or, more likely, in a mix of technologies to provide the optimum performance for the chain. For example, a common configuration is to use CMOS data converters with a high performance SiGe B i CMOS IF-to-millimeter wave conversion. The beamformer may be implemented in several technologies as shown, depending on the system requirements, as we will discuss next. 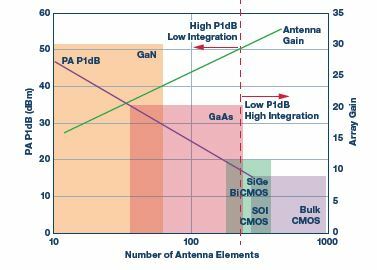 Depending on the choice of antenna size and transmit power requirements, it may be possible to implement a highly integrated silicon approach, or it may be a combination of silicon beamformer with discrete PA and LNA. An analysis of the relationship between transmitter power and the choice of technology has been presented in previous works and will not be repeated in depth here. However, to summarize that analysis, we have included a graph in Figure 4. The selection of power amplifier technology is based on the combined consideration of required transmitter power, the gain of the antenna (number of elements), and the RF power generating capability of the selected technology. As shown in the graph, the desired EIRP may be accomplished with fewer antenna elements using II-V technologies in the front end (low integration approach) or by using a silicon-based, high integration approach. 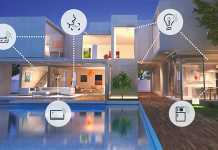 Each approach has advantages and disadvantages, and the practical implementation comes down to engineering trade-offs of size, weight, dc power consumption, and cost. To generate an EIRP of 60 dBm for the case derived in Table 1, the analysis in the presentation “Architectures and Technologies for the 5G mmWave Radio” concluded that the optimum antenna size is between 128 and 256 elements, with the lower count enabled by GaAs power amplifiers, while the larger one is achievable in all-silicon beamformer RF IC-based technology. There are definition and published specifications, as well as transmit power limits, from the FCC by equipment class and here we follow the 3GPP terminology for base stations. As illustrated in Figure 5, the class of equipment more or less defines the choice of technology for the power amplifier. While not an exact science, we can see that the mobile user equipment (handset) is well suited for CMOS technology and a relatively low antenna count can achieve the required transmitter power. This type of radio will need to be very highly integrated and power efficient to meet the needs of portable equipment. The local area base station (small cell) and consumer premise equipment (transportable power) share similar requirements and span a range of technologies from CMOS on the low end of transmitter power requirements to SiGe Bi CMOS for the higher end. 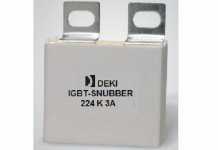 Medium range base stations are ideally suited for SiGe B i CMOS technology to achieve a compact form factor. 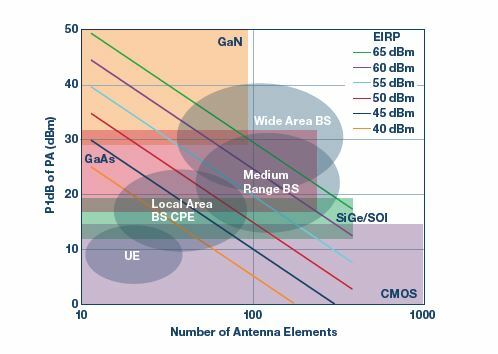 At the high end, for wide area base stations, there is a range of technology that may be applied, and it comes down to the trade-offs of antenna size and technology cost. 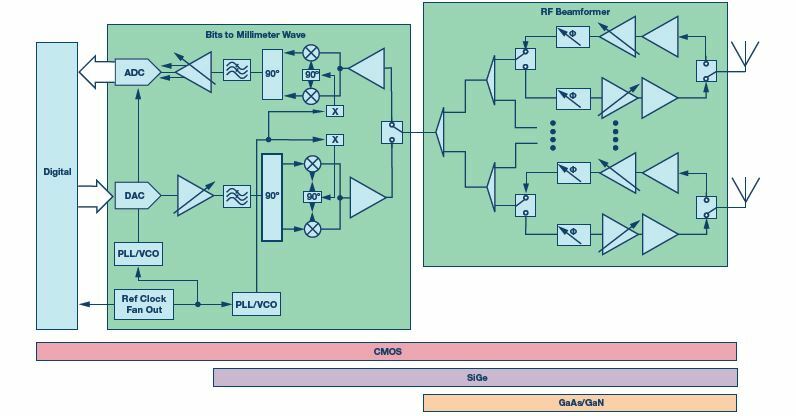 While SiGe Bi CMOS can be applied in the 60 dBm EIRP range, GaAs or GaN power amplifiers are more practical for higher power. and choice of semiconductor technology for an antenna with 60 dBm of EIRP. The snapshot in Figure 5 is of current technology, but much progress is being made in the industry and technology continues to improve. 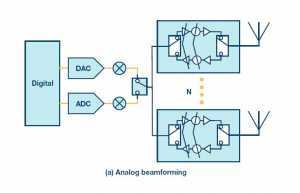 As mentioned in the “Architectures and Technologies for the 5G mmWave Radio” presentation, one of the key challenges for the designer is to improve the dc power efficiency for millimeter wave power amplifiers. As new technologies and PA architectures emerge, the curves above will shift, and more highly integrated structures will be available for the high power base stations. A good overview of advancements in PA technology is presented in the presentation “A Short Survey on Recent Highly Efficient cmWave 5G Linear Power Amplifier Design. Let’s move on now to the bits-to-millimeter wave radio in more detail and explore the challenges in this section of the system. It’s critical to translate the bits to millimeter wave and back with high fidelity to support high order modulation techniques such as 64 QAM and possibly as high as 256 QAM in future systems. One of the main challenges for these new radios is bandwidth. 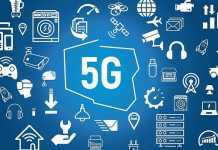 The 5G millimeter wave radios must nominally process 1 GHz of bandwidth or possibly higher depending on how the spectrum is allocated in practice. While 1 GHz of bandwidth at 28 GHz is a low relative (3.5%) bandwidth, that same bandwidth at an IF of, say, 3 GHz is much more challenging to design for and requires some leadingedge technology to achieve a high performance design. Figure 6 illustrates an example of a block diagram for a high performance bits-to-millimeter wave radio based on components form the Analog Devices’ broad RF and mixed-signal product portfolio. This signal chain has been demonstrated to support contiguous 8× 100 MHz NR carriers at 28 GHz with exceptional error vector magnitude (EVM) performance. More details on this signal chain and its’ demonstrated performance can be found in the Analog Devices video, 5G Millimeter Wave Base Station. 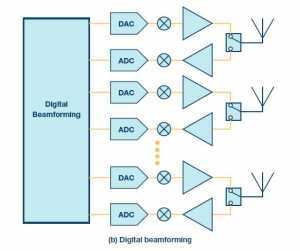 In both the transmit and receive IF stages we suggest digital gain amp- lifiers that convert from single to balanced and vice versa to avoid the use of baluns. Here we show the ADL5335 in the transmit chain and the ADL5569 in the receive chain as examples of high performance broadband amplifiers. The ADF4372 is a wideband microwave synthesizer with an industryleading integrated PLL and ultralow phase noise VCO with output capable of 62.5 MHz to 16 GHz. It allows for the implementation of fractional-N or integer-N phase-locked loop (PLL) frequency synthesizers when used with an external loop filter and an external reference frequency. VCO phase noise at 8 GHz is an impressive –111 dBc/Hz for 100 kHz offset and –134 dBc/Hz at 1 MHz offset.